Though to add to that, in point of fact any dog which is overfed and fed the wrong food is going to have internal problems, which is not going to improve their disposition. 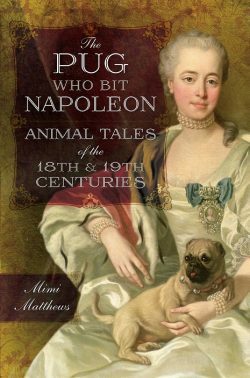 Nobody feels happy with a sore inside… and I suspect the pug is a literary short cut to show up the shortcomings of the foolish mistress more than it is a slur upon the dog…. It’s a small world… I’m in animal rescue too, mostly cats, but I homecheck for dogs too. Our cats only have two slaves – hubby and me. unfortunately we have M.E. so we can’t have dogs as we can’t guarantee to walk them every day…. maybe we’ll fetch up with a three legged pug one day, lol! I’ve met so many literary scholars, writers, and historians that are somehow affiliated with animal rescue or animal welfare causes. It’s really wonderful. Perhaps the level of empathy we have with characters from the past or characters in our novels is the same sensibility that pushes us to help needy animals? Reblogged this on Ace Britain & History News. Love this post! My mother had pugs for years. Her last two – Elvis and Priscilla were rescues and lived well into their teens, horribly spoiled and adored by all. One of my coworkers has a pug named Otis who is perhaps the most spoiled dog on earth. She buys choice cuts of meat and cooks them with vegetables for him every day. But he is terribly cute and sweet. Queen Victoria’s pug dog looks like her. Made me think of the movie, Best in Show. A hiliarious look at our empathy with dogs–Harlan Pepper and his bloodhound Hubert is my favorite. Lovely post. I’m definitely rethinking my feelings about pugs! I’m glad you liked it, Lillian. Thanks so much for commenting!